It is builded at the convenience location which is 5-minutes walk from Gifu Station Meitetsu Gifu Station. Rooms are installed large window with a good lighting and high ceiling, also single bed width 140cm (Twin 120cm). Guest can enjoy bath salts, body sponge etc amenity goods, coffee and four kinds of tea set ets goods. 1-minute less walk to convenience store. 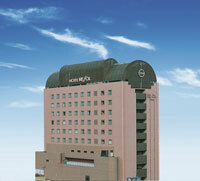 It is Ideal for business, shopping, travel and offers the upgraded comfortable services.